A canoe trip as a teenager brought our editor to an awe-inspiring great blue heron colony and a lifetime of St. Croix River exploration. In backwaters of the St. Croix River on long April afternoons, gangly great blue herons flap in the treetops and perch precariously, squawking and screeching, tending nests and feeding their young. Nearby, they stand as stone in the shallows, glide over the water, stab at frogs and fish. For many spring seasons, there has been a heron colony on an island about ten miles upstream of Marine on St. Croix, just above Cedar Bend. Here a hundred or so birds inhabit a temporary community, an insular colony concerned only with the survival of its species. I first encountered this magic when I was sixteen, when Stillwater science teacher Jeff Ranta took a group of us canoeing. We launched from Osceola Landing, every canoe carrying the conversation of young friends afloat. Nervous and excited and awake. A big gray sky above, the trees budless, the floodplain forest featureless. It was a few miles and about an hour to the rookery, by way of a backwater. All was quiet except for birds singing in stereo from both banks, which is a special form of silence. Such a springtime chorus is a chaotic melody of joy and hope and it has come forth from the banks every spring for millennia. Who knows if a bunch of high school kids heard any of it? We were busy singing our own songs. Then, the Stillwater Area High School Bio-Earth Club arrived at the rookery. That shut us right up. It has ever since. The high water of springtime allowed us to float right through the island, drifting between tree trunks below their nests. We were speechless – intruders in a world we hadn’t known existed. We wished for long, flexible heron necks so we could stare straight up forever. Some of the birds stood still and silent on their nests, but most were in motion, hopping around on branches at the top of their silver maples, raising a general ruckus. They had more important things to think about than a bunch of kids in canoes. 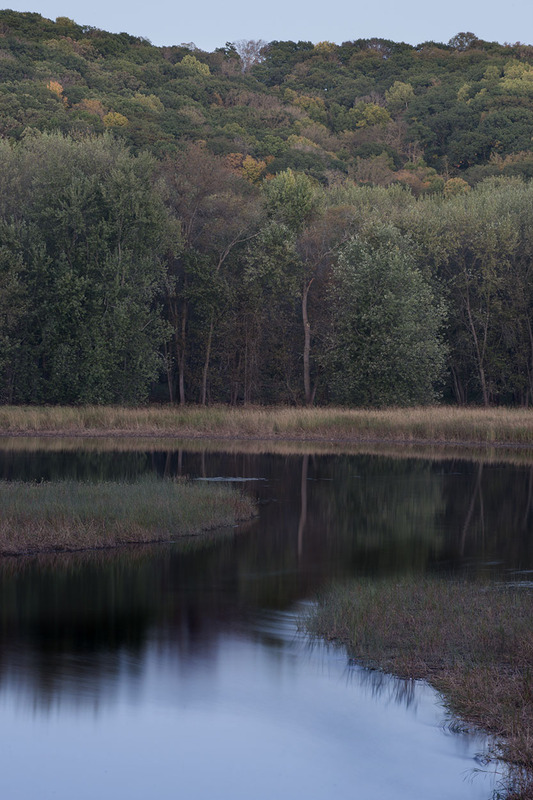 The St. Croix River’s magic can be elusive. While tens of thousands of people experience the river frequently, by driving across it on a bridge, or strolling alongside it, cruising on a boat, admiring a valley vista from a house on a bluff, much of its mystery is easy to miss, like the anonymous islands that host great blue heron nests. To know the river’s little secrets is to know its true grandeur. To see the connections between those secrets is to experience awe. After watching the herons for a while, we headed farther downstream, to a place where a spring creek tumbles over rocks into the river, and ending the trip at a landing where Swedish immigrants first stepped off steamboats 150 years before. In the following years, I slowly became obsessed with the St. Croix’s endless secrets. I go to familiar sections in all seasons, and explore new stretches. Like any river, it’s never the same twice, and that’s why I never tire of writing about it. Much more to say, and more to come. Subscribe here for email notifications.